Looking for an "economy" encoder? The TOKN KB16 is the new kid on the MAME keyboard encoder scene, an inexpensive encoder that still manages to include some "premium" features. So, how does it perform, and how does it stack up to the competition? Check out the review! Doris Self is not your average gamer. At 80 years old, she's one of the oldest, and she's not done yet: she's attempting to re-take the world record in Q-Bert, a record she held back in 1984. Can she do it? Stay tuned! Yes, after a long drought, a new review on RetroBlast! This time I look at the GameCab Inc. LED Driver Board, a handy way to quickly wire up LEDs in your control panel with a minimum of fuss. It even includes support for the IPAC keyboard LED outputs. Check out the review over on the Product Reviews page. I've received a number of requests for RetroBlast to review the Groovy Game Gear GP-Wiz49 adapter for 49-way arcade joysticks. Well, I've emailed Randy Turner a couple of times, and have received no reply. I'll keep trying, and hopefully get a response. I'm still waiting on the order from Happs. Sorry, no real news yet, but hopefully sometime soon. Sorry for the lack of posts the last few days, was down with a bug. Feeling better now, though! Anyway, it's a great read, and is now available over on the RetroBlast Retrogaming Articles page for your enjoyment. Wow, after a long drought following the death of the LAME Arcade LED lighting project, now the floodgates have opened. Randy Turner of Groovy Game Gear has just posted news of his new LED lighting project (including a video). This is in addition to the ongoing BubbaBing/GameCab LED driver project (with just added some new software mods to MAME to allow blinking Start buttons in all games). Of course, you'll want to be sure and check out the translucent buttons that will soon be available! Looks like a great time to start planning for a light up panel! 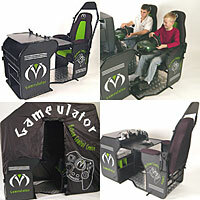 Here's something cool if you live in the UK: the Gameulator, an arcade-style setup for playing console games! It looks like an excellent piece of kit, with fold down trays for driving controls, places to put your other controllers, and diamondplate flooring (so you don't put a hole in the floor when you slam your feet down in anger ;-) Heck, there's even a "tent" available for it so you can shut out the outside world. There's even a special pricing deal on the cabs going on right now through Gremlin Solutions, so check it out soon if you're interested! Pac-Man is now the number 1 arcade game in the world, according to the Guinness Book of World Records. Way to go, Pac-Man! One of the things that made the arcades great was coming in and finding someone had beaten your high score on your favorite machine. No, wait...what made the arcade great was reclaiming your high score! Now a new add-on for MAME promises to bring back the thrill of actual competition: Naked Arcade is a utility that will monitor your game scores, and if your score is in the top 50 of posted scores, it will upload your score to an Internet "hall of fame." Yup...well, at least in respect to their upcoming Revolution Console system. According to the article, "...the system's slot-loading player will also accept and play the smaller discs from Nintendo's current-generation GameCube. However, the big news is that the Revolution's backward compatibility doesn't stop there: the console includes a built-in emulator that will let users download--for a fee, presumably--and play just about every game from all of the Big N's past systems: Nintendo 64, SNES, and even the original Nintendo Entertainment System." Building a MAME system has been getting a bit more complicated recently, due to the fact that most new motherboards only have PCI-Express (PCI-E) slots, while the video card of choice for MAME systems, the Ultimarc ArcadeVGA, requires an AGP-slot. Help may be on the way: Albatron has announced an AGP-to-PCIE Adapter Board, which might be just the ticket. Not too many details available yet, but I'll keep looking into it. The E3 announcements begin: Namco has announced that 15 of its classic games are going to be released for cell phones, including titles such as Pac-Man, Xevious, Pac-Mania, and more. Hopefully the new releases are better than the awful official Pac-Man cell phone game that's currently available! So Namco closes down all of the Aladdin's Castle arcades — what's an arcade operator to do? Open the arcade back up, of course, and start acquiring your own games. The true story of a true believer. Just got word that Dream Arcades now is selling arcade parts, and their prices are pretty good: 3-inch PS/2 trackball with 3 free buttons for $59.99, a JAMMA wiring harness for $8.99, and Pushbuttons w/microswitches as low as $0.65. The X-Arcade control panel had a "starring role" in an episode of Alias recently, helping to guide an RC "spy car" into a top-secret installation. There's even a video clip of the X-Arcade's heroics available on the site! The final missing piece in my quest for a light up control panel: a whole collection of colored, translucent arcade buttons! Just the thing for a light-up control panel (using something like the upcoming "BubbaMAME" LED driver board or the current LED driver board by GameCab Inc. No word on pricing yet, but they sure look pretty! Yes, another article discovering that video games are actually beneficial and don't actually turn our kids into goth-lovin', gun-totin' maniacs. Looks like there's a new webisode posted on Coin-Op.TV, an interview with Jon Gibson, the curator of the "i am 8-bit" art exhibit in Hollywood, California. Coin-Op.TV has a lot of other interviews coming up, and they're also heading to E3, so there should be lots of other cool stuff coming soon. Okay, everyone set the hands on your "Way Back Machine" to 1971, so that we can experience when Computer Space was first unleashed upon the world. Don't have a Way Back Machine? Well, then check out this new Computer Space Emulator, so that you can still try out the very first arcade video game! Difficult Answers About Video Games: Free! Direct from the press release: "PublicBeta are proud to announce the launch of their new ‘look’ site, and to celebrate this development PublicBeta are offering their first videogame book publication Difficult Questions About Videogames FREE for a limited time only via publicbeta.org"
An "Open Source" Joystick Interface? This is unique: a "build-your-own" keyboard/joystick interface that's being offered under the GPL license. Complete plans are available. If you're looking for a customizable and cheap keyboard encoder, and you've got the skills to roll your own, this is probably something to look into! Okay, you're into racing games. Really into racing games. What's the best possible interface for playing games? How about an actual car? The "Real Virtual Car" project team have taken a real car, stripped it down, and are now outfitting it as the ultimate driving simulator. Everything from the steering wheel to the gauges will be computer interfaced. My geek heart is pounding fast. 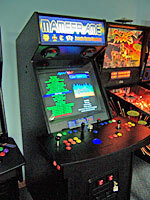 Just up on RetroBlast is Bob Seidel's interview with MAME developer R. Belmont. A mysterious figure who is involved with a number of different emulation projects, R. Belmont gives it up about his favorite games, controllers, and more. I just stumbled across a new web site devoted to pinball: Pinballing.com is the fresh new face in town, and they're looking for writers (sound familiar?) It's off to a promising start, and the more pinball sites, the better! What to see what the life of a pinball enthusiast is like? Check out this photo montage video of Classic Arcades proprietor Jeff McAfee's pinball-lovin' life. A couple of RetroBlast readers have written in asking what I found out about the problems I was having with my Betson Multisync arcade monitor. Well, first off, I'm very happy to report that I now have a new chassis board set installed and the monitor is working perfectly. As to the problem with my monitor? Well, the board failure I had seems completely unrelated to the recent Kortek monitor "retrofit", which was related to a minor grounding issue. I'm not sure what failed with my board set, but the bottom line is that all is well and the monitor is once again working like a champ. Discussions have begun concerning the design for this year's edition of the BYOAC game tokens, so be sure and visit the message thread if you'd like to add your two cents (or one token)'s worth. The Electronic Entertainment Expo (E3) is coming up on May 17th-19th in Los Angeles. Hopefully we'll see some retrogaming-related announcements. Finally, a really good use for those new ultra-large plasma TVs! None of this HDTV garbage, give me a Plasma Pinball machine! It even includes a 37" display as the "translight/scoring" area! There's a different plasma pinball machine coming out as well, a cheaper version (probably). Thanks to "Dead Dad" for posting the news on alt.games.mame! Want to play the original Pac-Man, but want a new "twist"? How about a 3D Pac-Man emulator that uses the original ROMs? Check out Pacifi3D, a Pac-Man emulator that translates the original game graphics into OpenGL 3D. There's even a first-person perspective for that "you are there" sensation. Thanks to Wolfram Roesler for the link! Tommy Tallarico and the Clear Channel Music Group have put together a new touring musical event titled Video Games Live. Starting with a July 6 concert at the Hollywood Bowl and continuing to venues such as Denver's Red Rocks and Boston's Tweeter Center, the tour will feature orchestras, choirs and visuals such as laser shows and footage of games, to be played live by audience members. Featured music will include songs from several generations of games. Want to create a plexiglass control panel covering, but don't know Lexan from Lucite? Will Yen has created a great guide on choosing and working with the right plastic for your cabinet project, and it's now posted on the RetroBlast Retrogaming Articles page. A new upright cabinet kit has just been announced by Dream Arcades. It looks great, and I especially like the unique hinged monitor bezel and front access door. Dream Arcades is currently gearing up for production, and are offering special pre-order pricing discounts if you email them. Looks like a cab news day — SlikStik is offering a sale this month on their cab/controller "combo" kits: $100 off the Quad or C02 Cab combos, or $50 off the Classic Combo. Is it just me, or does that sound like a fast food order: "I'll have the Classic Combo with a side of pinball buttons.